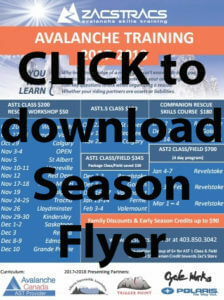 This is an Alberta Safe Riders Avalanche Training Offer to all those we have met over the years running the school programs for the Alberta Snowmobile Association. Thanks for your interest in our avalanche classes! 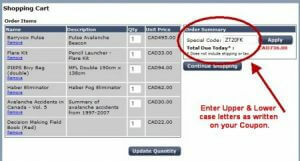 Zac’s Tracs has been working with snowmobilers in Western Canada for 18 years! Click on the flyer or scroll down to the ‘Quick Links’ listed at the bottom of this page to see all the communities that we have classes this season. Surely one of these options will fit your schedule! If you found this webpage by following a QR code be sure to key in the promo code that was with it into the Special Code box on the credit card page of Zac’s Tracs online store. See the image to the right. CLICK HERE if you are ready to register. CLICK HERE if you would like a hand with your registration.